John Tavares is already making an impact for the Toronto Maple Leafs. 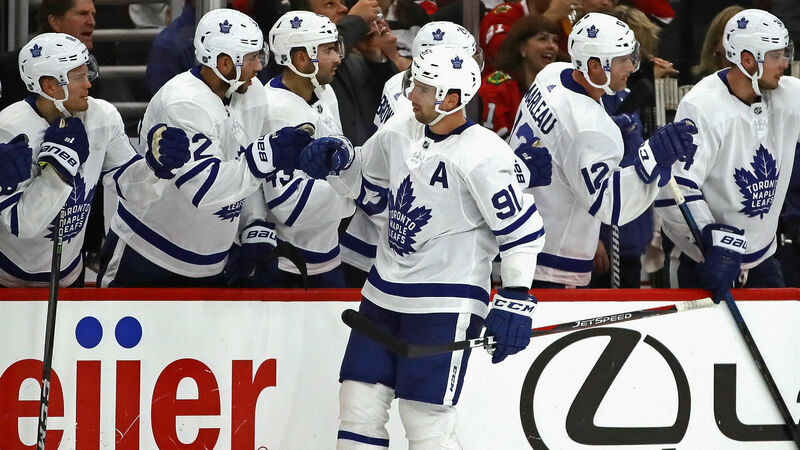 In his third game with his new team, Tavares netted a hat trick in Toronto’s 7-6 overtime win over the Chicago Blackhawks on Sunday. Tavares scored his first goal in the first few minutes of the second period. As the Maple Leafs had possession in the attacking zone, defenseman Morgan Rielly took a shot a few feet in front of the blue line. Blackhawks goaltender Cam Ward saved Rielly’s shot, but Tavares charged to the right side of the crease and buried the rebound to put Toronto up, 3-2. After the Blackhawks tied it a couple minutes later, Tavares retaliated at the 7:37 mark of the second period. With the Maple Leafs on the power play, Tavares won a faceoff in the attacking zone and the puck made its way to Mitch Marner as Tavares went to screen Ward. Marner took a shot from the right point, which was tipped in by Tavares, to give the Maple Leafs a 4-3 lead. But that wasn’t the end of the scoring as three goals were scored in the final 90 seconds to send the game to overtime. Rielly won the game for Toronto by scoring 19 seconds into overtime. Auston Matthews scored twice and Kasperi Kapanen scored once in Toronto’s win. Sunday’s hat trick marks Tavares’ first in the Maple Leafs uniform and gives him four goals this season.